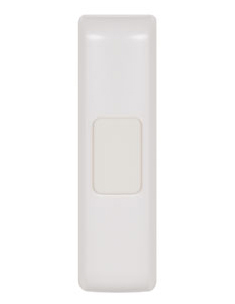 Compatible with the STI-3353 wireless receiver, the STI-3301 wireless button can be added to back doors, gates, garage doors, or anywhere else you want within 250' of the receiver. This button can be added to back doors, gates, garage doors or anywhere. It has up to 500 foot operating range and has 32 selectable codes to help block interference from outside signals. The sound can be set on the front of button. Includes two 3 Volt batteries. Button transmits 10 selectable sounds to STI-3353 receiver. To purchase the doorbell button and receiver together, see the STI-3350 Wireless Doorbell Button with Chime.